I like it but need a bigger car. It is fun to drive, the accerlation and ride is very smooth. And also the handling easier coming from a big truck to this compact one. The cost to fill the tank ran no more than $30 at a price of $3.60 ish a gallon very reasonable. Lo sentimos Jeep Patriot, no hay avisos que se correspondan con lo buscado. Aquí presentamos avisos en todo el país de Jeep Patriot. Aquí presentamos todos los avisos de todos los años disponibles de Jeep Patriot. 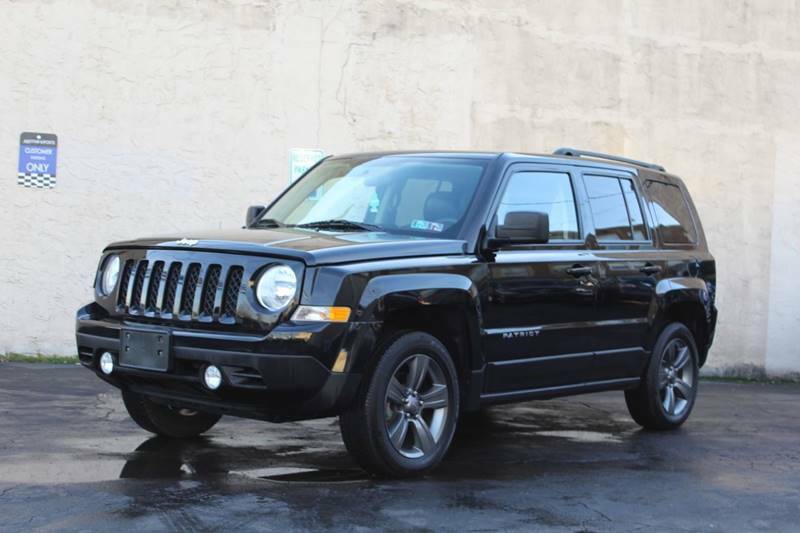 Lo sentimos 2014 Jeep Patriot, no hay avisos que se correspondan con lo buscado. Quizás te interesaría uno de estos avisos de años similares de Jeep Patriot usados. Prom. Calificación del concesionario: (18 evaluaciones) "I wrote to you and told you that I could not get a firm price I live in Florida and was told I had to come in to get the full real price and that the 15K was after a 1500 dollar deposit then there was dealer prep and other dealer fees and all I wanted was a full price without sales tax as I would pay that in Florida and they told me I had to come in to get that. I feel that the are deceitful and lied about the price and G-d knows what else. Call them and play like you are intrested in the car and see what you get for answers "
Prom. Calificación del concesionario: (15 evaluaciones) "I called them back and travelled there to look at cars/ ABC in Barboursville was great. I bought a car from them." Prom. Calificación del concesionario: (10 evaluaciones) "Good service they answered back and one of the best prices I seen yet on the there cars good people good quality cars..."
Prom. Calificación del concesionario: (35 evaluaciones) "The online description of the vehicle’s features was inaccurate! It did not have the gps or back up camera listed. I was promised that I would have a back up camera installed free of charge. I accepted not having a gps and they did lower the price. Over 30 DAYS later, my back up camera was finally installed and it is horrible! The mechanic that the salesman sent me to, only used 1 screw to mount my camera on my tailgate. Only the right side is attached. The left side is unattached and hanging so my picture is not level at all! It moves every time I go through a car wash and even every time I shut my tailgate. I’m constantly readjusting it. I will now have to pay to get someone to attach the other side of the camera so that it’s sturdy and displays a level picture. The AC in the vehicle does not work and the vehicle had not been serviced besides getting a recall fixed! There were no other service records and the oil was FILTHY! It was last inspected 5/2018 so my tags will soon expire." Prom. Calificación del concesionario: (18 evaluaciones) "Great "
Prom. Calificación del concesionario: (62 evaluaciones) "The Internet sales person yada, responded immediately via text message email and a phone call. However the hard-sell push to come in for a test drive immediately with scheduling an appointment to get a $20 gift card started right off the get-go. I was called by four different sales people in the matter of a three day period to try to get me in to look at the truck when I finally asked for the bottom line out the door price for the vehicle I was given a $250 discount off of 54k and told that’s all they could do. The vehicle ultimately sold for $4500 less than the asking price which I never received, within about a week. I have purchased vehicles from Sarasota Ford before but this seems like an ultra high pressure sales." Prom. Calificación del concesionario: (98 evaluaciones) "Very very poor customer service!!! waste of time and waste of $$$$ bought a warranty for 2500 my car has several lights on called dealer several times. asked to speak to manager was hung up on . called back only to be put on hold for 15 m then told they can fix my car 3 weeks from call!! car almost left me on my way to work! this place needs to be investigated!! 0 stars!! very dissapointed!" Prom. Calificación del concesionario: (72 evaluaciones) "This dealer was very helpful in giving information on the vehicle "
Prom. Calificación del concesionario: (47 evaluaciones) "The lady was very helpful and kind." Prom. Calificación del concesionario: (61 evaluaciones) "Stay away. Vehicle was priced decently, if you are going to use them for financing, that is where they are making their money. Unfriendly sales staff, not professional. To Star, if you believe I'm purchasing/financing from you "That ain't going to happen"." Prom. Calificación del concesionario: (36 evaluaciones) "Scammers, that’s all I can say "
Prom. Calificación del concesionario: (22 evaluaciones) "Worth going to.i drove all over Ohio for 3 days looking for a car found this one and out of all 54 used dealerships this one was actually truthful with is. Definitely worth going to and I will return when I need a new vehicle"
Prom. Calificación del concesionario: (88 evaluaciones) "Quick response."